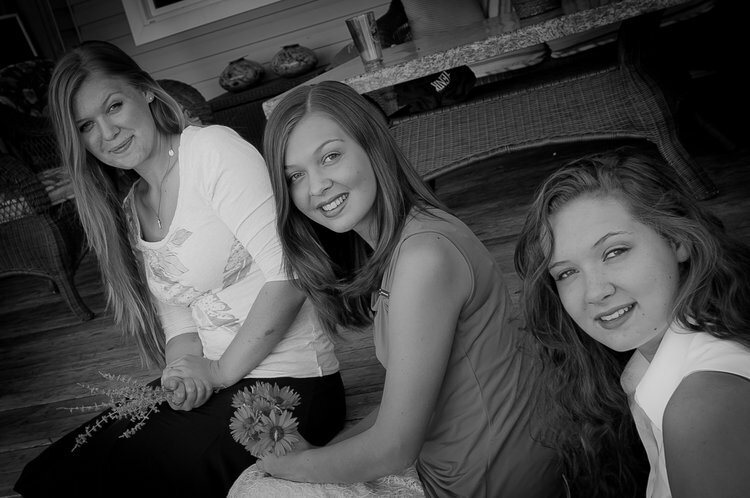 Being the mother of several lovely teenage daughters—young, bright, and beautiful. All of them hoping to get married some day. Or at least they think they will. But to tell you the truth, they’ve grown a little doubtful lately. The girls observe these marriages around them falling apart right before their eyes. They’ve seen the destruction of divorce and have stayed up late comforting dear friends whose parents are parting ways. Or, they watch while some couples stay together, yet grow increasingly cold and distant. It troubles them to think of their lives ending in this unhappy way. It messes with their minds and messes with their dreams. They’re not little girls anymore and they understand that life is no fairytale. But they can’t help wondering where did all the good stories go? You know, the ones with a happy ending? And this is what I tell each precious one . . . . I believe in a good God who desires to write a beautiful story for our lives. Rather than looking at the messed-up world around you, fix your eyes on Him who is more than able to care for you. He is the One you can trust for your hope and for your future. I believe in a God who’s in the business of changing people. He can change me and He can move that man of mine. He has the power to transform our marriage into something wonderful and glorifying to Him. I believe in a God who restores and redeems. He can heal the broken and save the lost. I’ve seen Him turn lives around and rescue marriages from the most impossible situations. I believe in a God who sees the big picture. While we might only see the snapshot – what is happening today – He knows what our future holds. You can take your daddy and me, for example. Here we are, two imperfect people who have learned to love each other—who are still learning to love each other. Look at the good work God is doing in and through our life together. Growing, learning, forgiving and loving some more. This is the stuff that makes for some of the best stories. This is a real love story. With a very happy ending. So that’s the kind of story I’m hoping for our daughters and the kind I’m hoping for you. Not because I believe in fairytales, but because I believe in a good and powerful God. Let’s call on our God – He who is able to do exceedingly abundantly above all that we ask or think – to do His beautiful work in our lives and relationships! 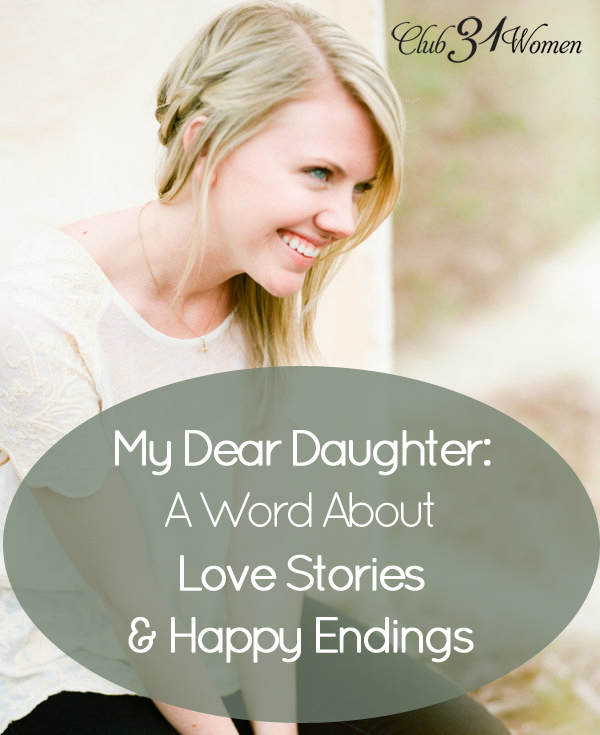 I have four daughters and I will be sharing this post with them…thanks for taking the time to write and share! I hope your girls are encouraged as well, Janelle! Thank you so much for this encouraging post! I struggled with wondering if marriage was “worth it” when I was a young woman looking at the marriages around me. However, this is a conversation a lot of parents are hesitant to have with their kids. All of us who are married know that marriage between two sinners is challenging, but we don’t want to squelch our children’s dreams. Your perspective makes it so much easier to discuss with young people – Yes, marriage is a struggle, but Yes, God does restore and redeem it! What a beautiful way to offer reality and hope to our children! I suppose it’s that balance between “reality and hope” that’s the real challenge. I want them to hold on to both of these and see how God can make – good and sometimes hard – things beautiful in His time. My husband and I came from broken families. We are both first generation Christians. We have been married for 12 years perfectly imperfect. There is nothing in us that qualified us for a great marriage. But, we both are Gods and he gives us everything we need. We are best friends and madly in love with each other. Last year I dreamed I was a young bride again marrying my husband. When I awoke I told my husband I had the most wonderful dream I married you and it’s real here you are! That is how I feel our reality is better than a fairy tale. I also love being a Mom of our three children. God plans for us are amazing even on the regular unspectacular days if you slow down you could see a house full of friends in love with their God, spilling milk and cleaning it up together. On a boring day you’d see a contentment a peace a little bit of heaven that only comes from God. He wraps that around those that love him. On a bad hard day when trials hit and it looks messy you’d see a man and women holding hands together as they pray getting their strength from God broken and hurting knowing their heavenly father will turn things around as he always does. I look back ward combining all the days in my mind and the whole journey thus far is more spectacular than I imagined and I look forward to what our future holds. I love reading your journey as well very encouraging! What a lovely testimony Gabriel! I loved hearing every word. Thank you so much for sharing what God is doing in your lives and family…. Amen! It’s really about the Lord isn’t it? Keeping our focus on Him. 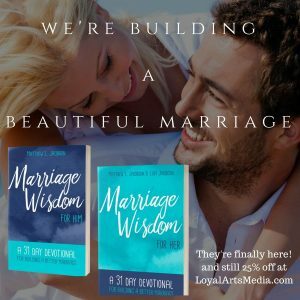 We have 2 sons and 4 daughters and I could easily get discouraged about their marital futures ~ especially seeing the marriages falling apart all around us. But by God’s grace, He alone has taken two imperfect people (us!!) and been the glue to hold us together. 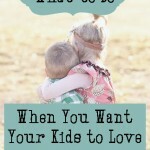 I pray often this would be true for our children as well! And I hope the same for your children! I have such a heart for this next generation – that they will walk with God and keep their eyes on what He is doing….rather than what others might be doing around them. Thank you Lisa. The sweetest love story is the one about Jesus and it has the very best ending. Amen! “The sweetest story is the one about Jesus” – that is right! This is just so awful and tragic and discouraging, and yet, when we focus on what God wants more than anything in our lives- it is beautiful, dreamy and encouraging!! I thank God for His Truth that we can cling to and share with our children!! I always tell my kids that God has already Hand-Picked the one for them… 🙂 Trust that. Be faithful and prayerful… and patient and hopeful and EXCITED!! We pray nearly every day for the someday-spouses of our children. And personally, I can’t wait to meet each one! Such an encouraging post. God is not above writing and editing our love stories. He surely isn’t, Chels. And sometimes that involves some “heavy editing” too :). Thank you for this! I am praying for my marriage to be rescued as both of us have made mistakes. I’m praying for you right now, Nadine. I’ve seen many marriages rescued and pray the same for you too! LOVE this, Lisa! My favorite is that we have “a God who restores and redeems”. Yes! He can make all things new, he can repair the things that we break and he can make strong the things that are weak. Amen, Jen! Someone recently gave me a necklace with a charm that has a single “R” engraved on it – R for Redeemer. I love sharing that truth whenever anyone asks me what it stands for. Our Redeemer lives.